If you’re lucky enough to catch a glimpse of a red fox you might be startled by the brightness of its reddish-orange coat. You might even wonder, as I have, why the animal would have a coloration that would hinder its ability to hide. I don’t know the answer to that question, but I do know that the animal’s striking color combined with its grace and agility makes every sighting memorable. But what about all the times we don’t get to see red foxes? How can we know where they spend their time? They’re certainly present in the Hammond Hill area through all four seasons, and it turns out that they leave evidence of their presence even when there’s no snow to record their movements. 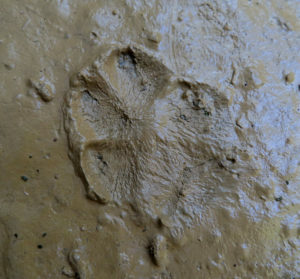 Back in the spring I was walking along a Hammond Hill hiking trail when I came to a muddy spot, and in the mud I saw some red fox tracks. The one on the left is most obvious—it’s heading toward the top of the frame and there’s a tiny new leaf right in the center of the track. To the right of that one there are two other tracks, both headed toward the bottom of the frame. If you keep looking you’ll see still other, fainter tracks. But if I hadn’t been in the habit of checking muddy spots whenever I come across them it would have been easy to miss all of those prints. 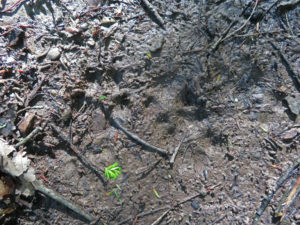 The number of tracks in that muddy spot indicated that the animals were repeatedly using the trail I was on. 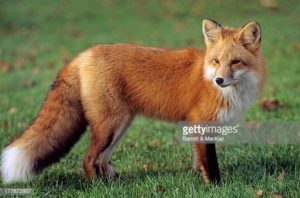 That’s not as surprising as it might seem, because red foxes are in the habit of using human trails as they go about their business. And in late May, when I found those tracks, fox business probably involved catching lots of small mammals to feed to their growing pups. The tracks were most likely left by a mated pair, and they must have been making lots of trips between hunting areas and the den, catching small mammals both for their own consumption and to feed to their pups. 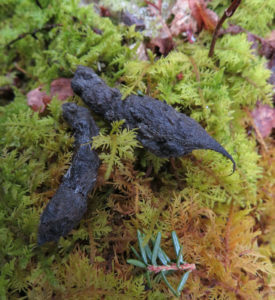 Many of the scats I found around that same time contained the telltale short, dark hairs of mice and voles. In the intervening months rainy periods have alternated with dry, sunny weather, and the muddy spots have grown and shrunk. And every now and then I’ve discovered red fox tracks on Hammond Hill trails. But family dynamics have been changing over that time period—the pups are bigger and stronger now, and they’ve been playing together and acting out instinctive hunting techniques. The juveniles are beginning to travel with the adults, and their education in hunting and survival skills is going into full gear. I recently found some drying mud puddles along a defunct logging road, and some of the mud was perfect for capturing tracks in beautiful detail. 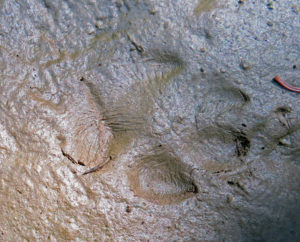 The front print of an adult (heading toward the upper left) showed the imprint of the hair which covers most of the underside of the foot, and also the horny, hairless bar which protrudes from the middle pad. And not far away in a different puddle (again with perfect mud!) I found smaller prints—too small to be adults but with the same red fox hairiness and middle pad bar. On several subsequent visits there were new prints of both adults and juveniles, so I concluded that a family must have been using that area. I didn’t go looking for a den when I found those tracks, because I didn’t want to disturb the family. 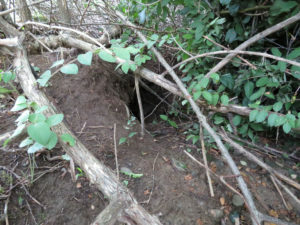 But Susan Rausch discovered a den near her house that didn’t seem to have current occupants [insert fox den.jpg]. I’m guessing it was used by red foxes, because they are known to den near houses and other locations with human activity. This might seem odd, but the foxes are very good at adapting to our activities, and our nearness gives them some protection from coyotes which could pose a threat to the young.